We’ve had a love-hate relationship with ‘Alice’ for a long time. 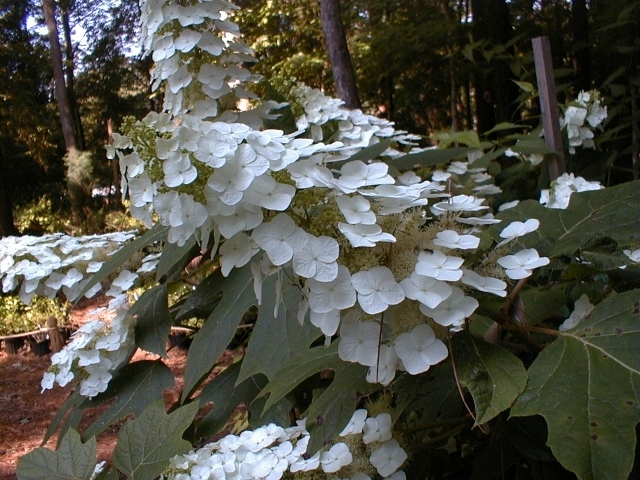 Alice is the name of our oakleaf hydrangea and she lives in our zone 8 coastal plain garden. We love her, but sometimes, we think she hates us. It’s not that she doesn’t put on a fine show in late spring. 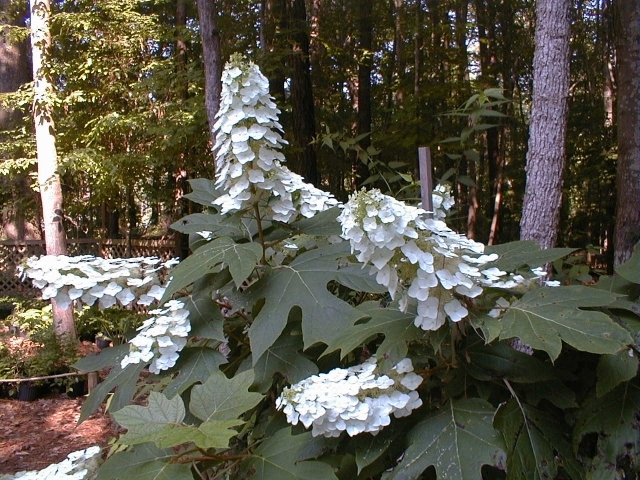 Of course she would, she’s so vain she wants people to ooh and ahh over her flouncy, cone-shaped clusters of white flowers. 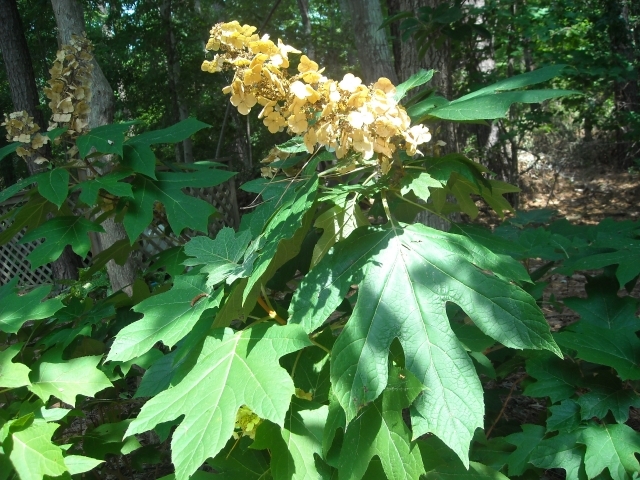 But in high summer, hot and dry, she turns positively slatternly with browned-off blooms and sulky leaves. creamy blooms dissolve into a modest blush. 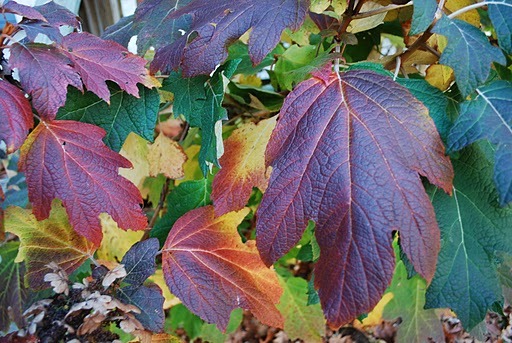 Later, as weather turns cool in these gardens, come-hither rainbows of burgundy, burnt orange and purple on bold “oak” leaves can wow a viewer. Frankly, we think she’s a bit needy. She loves hot summers. But not dry feet. Not wet feet, either. Can be persnickety in pots. Likes rich soil. Refuses to hurry her growth. Wants no close companions – wants to savor her middle-aged spread, stepping out with her stolons as she ages. Prefers organic fertilizer. Wants some shade in summer. Must have mulch to keep her ankles cool. Won’t tolerate pests or diseases. (Probably the reverse: bugs won’t tolerate her.) Needs a gardener-in-waiting to remove tousled blooms, fall or winter, and prune out old stems to keep her looking young and shapely. 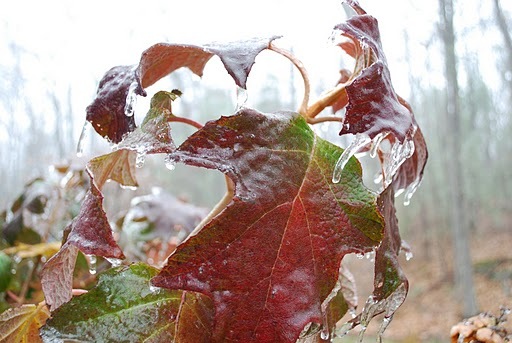 After all this, she doesn’t care a fig about how she looks all winter long, standing naked, shaggy bark exposed, gnarled crooked stems beckoning. We tried to be nice to our first Alice. We put her in a moist spot we thought she would like. She died. After the funeral we figured it out, poor thing. Bad drainage. It was wet feet that killed her. Probably the root rot. 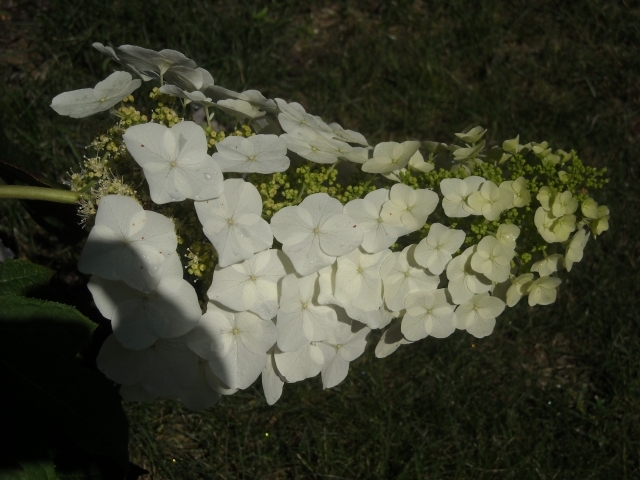 She did bequeath to us some of her offspring, propagated from cuttings. We’d learned our lesson, so we put the best one in a dry spot, uplands, at the head of a path, where we could admire her blooms from afar. The soil was sorely lacking in humus. She was peeved. We tried to make up for this by adding compost and mulching with shredded leaves regularly. When she sulked, we gave her water. She condescended to bloom for us, but rarely gave us any of those rosy blooms or rainbow leaves we’d seen elsewhere. Friends of ours grow a lovely Alice in a garden that was formerly a dog pen. Hmm…mm. Alas, when we gave her well-composted manure she rewarded us with large leaves that quickly became dish-rags in drought. In our yard, Alice probably misses the shady stream banks where her ancestors lived. There, they had constant moisture, good drainage and deep forest soil. That’s where botanist William Bartram often found them on his expeditions to collect plants in Georgia, Florida and the Carolinas during the Revolution. Over the years her ancestors were shipped to England to please gardeners there. There they languished. Too damp for their tastes. Probably the root rot did them in, too. Now, here’s a puzzle. 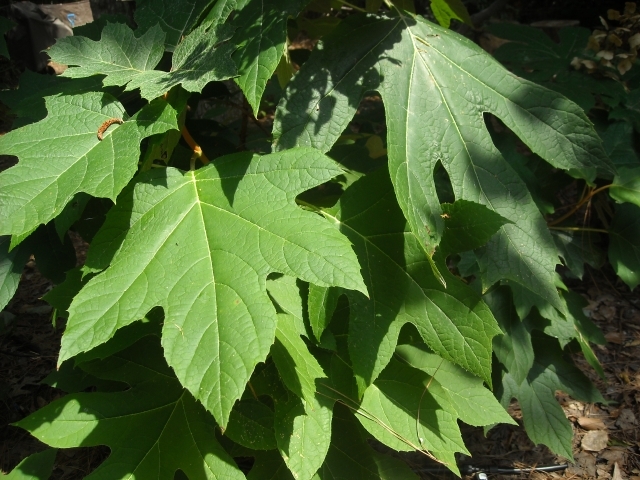 We planted one of Alice’s sisters not eight feet from a red maple growing in dryish soil. We said, this is not a good idea. Red maple roots are greedy for water. Alice is finicky about her soil moisture, not too much, but not too little, either. A perfect storm? But she was such a nice plant, and she looked so like a debutante against that picket fence, we just had to do it. We’ll be sure and water you, we promised. liked the spot. She and that red maple got along famously. After a while we figured out that they probably owed their compatibility to our laziness. We hate raking leaves and carting them around each spring. 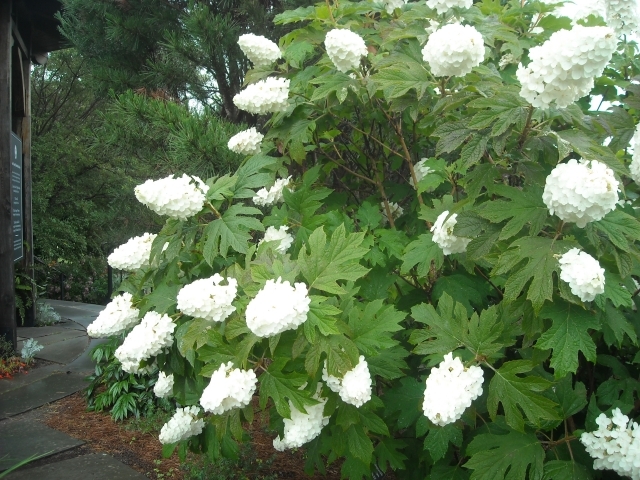 One day we got the idea of tossing a huge pile of them directly onto the maple-hydrangea bed, as big a pile as we dared. she has slowly prospered, even to the point of occasional rainbow leaves. For now, we are staying loyal to our Alices, but some day we’d like to meet the entire family. good article; i will share with as many friends as i can. thank you for posting.